All about the best team in the land and all the world Manchester City!!! : Marc-Vivien Foé will never be forgotten by City fans! Marc-Vivien Foé will never be forgotten by City fans! Today is the anniversary of Foé's death, we should all take time to remember him. He only played for City for one season but in that season he made a major impact. Foé was on the verge of signing a permanent contract at City but sadly passed away, I am sure he would have been one of the best midfielders we could have seen in a City top in modern times. 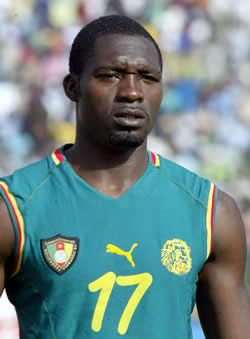 Rest in peace Marc-Vivien Foé (1 May 1975 - 26 June 2003) we will never forget you! RIP MVF - you're name adorned the back of my City shirt - 1 because you were my favourite player and 2 because your surname didn't cost much! Absolute legend and didn't deserve to go out the way he did at all. When Henry scored in the next Confed Cup game and pointed up to the heavens i got all emotional. Yes he scored some vital goals for us that season. Not wanting to jump up an down on anyones grave or anything but he wasnt my favourite player in the team, and he did tend to go missing from time to time. Regardless its always a sad day when someone passes away so young. A sad loss. However, I don't think he would've been one of the best midfielders at our club in modern times. If you remember, he was even the target of the boo-boys for a while during his short stay. I have no memory of him being a target of the boo boys to be honest and he would have been one of best midfielders that we have seen in recent times in my opinion.